The University of Denver (DU) is a private research university in Denver, Colorado. Founded in 1864, it is the oldest independent private university in the Rocky Mountain Region of the United States. DU enrolls approximately 5,600 undergraduate students and 6,100 graduate students. The 125-acre (0.51 km2) main campus is a designated arboretum and is located primarily in the University Neighborhood,  about five miles (8 km) south of downtown Denver. On March 3, 1865, John Evans, former Governor of the Colorado Territory, appointee of President Abraham Lincoln, founded the Colorado Seminary in order to help "civilize" the newly created (1858) city of Denver, which was then a mining camp. The seminary was founded as a Methodist institution and struggled in the early years of its existence. [ citation needed] In 1880 it was renamed the University of Denver. 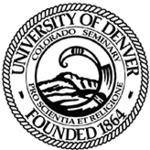 Although doing business as the University of Denver, DU is still legally named Colorado Seminary. The first buildings of the university were located in downtown Denver in the 1860s and 1870s, but concerns that Denver's rough-and-tumble frontier town atmosphere was not conducive to education prompted a relocation to the current campus, built on the donated land of potato farmer Rufus Clark, some seven miles (11 km) south of the downtown core. The university grew and prospered alongside the city's growth, appealing primarily to a regional student body prior to World War II. [ citation needed] After the war, the large surge in GI bill students pushed DU's enrollment to over 13,000 students, the largest the university has ever been, and helped to spread the university's reputation to a national audience. The central campus area also includes Evans Chapel, an 1870s-vintage small church which was once located in downtown Denver, and was relocated to the DU campus in the early 1960s. Buchtel Tower (1913) is all that remains of the former Buchtel Chapel, which burned in 1983. The administrative offices are located in the Mary Reed Building, a former library built in 1932 in the Collegiate Gothic style. Margery Reed Hall (named for the daughter of Mary Reed) was also built in the collegiate gothic style in 1929. Margery Reed Hall has recently[ when?] been designated to house the Undergraduate Program for the Daniels College of Business; an $8 million overhaul and renovation was just completed early 2014. The update for the building was to include more classroom space, a larger hall to host guest speakers, as well as mechanical and technical improvements. In autumn 2003, DU opened a new $63.5 million facility for its College of Law, what was later named the "Sturm College of Law." The building includes a three- story library with personal computers accessible to students. Donald and Susan Sturm, owners of Denver-based American National Bank, had given $20 million to the University of Denver College of Law. The gift is the largest single donation in the 112-year history of the law school and among the largest gifts ever to the university. The university has five residence halls, Johnson McFarlane Hall (JMac), Centennial Halls, Centennial Towers, Nelson Hall and Nagel Hall. Johnson McFarlane Hall was energy star certified in September 2011 as one of the most energy efficient buildings on campus  , and is the oldest co-ed dorm in the western United States. The Creative Writing Doctoral Program in the Department of English, one of the oldest such programs in the nation, is ranked 1st by Poets & Writers magazine. The program was founded by the distinguished novelist, John Edward Williams, co-recipient of the 1973 National Book Award in Fiction, along with John Barth, for his novel Augustus. The Aspen Institute's 2011–2012 edition of Beyond Grey Pinstripes, a biennial survey and alternative ranking of business schools, recently[ when?] ranked the Daniels College of Business the 15th best MBA program in the world. The survey puts emphasis on how well schools are preparing their students for the environmental, social, and ethical complexities of modern-day business.